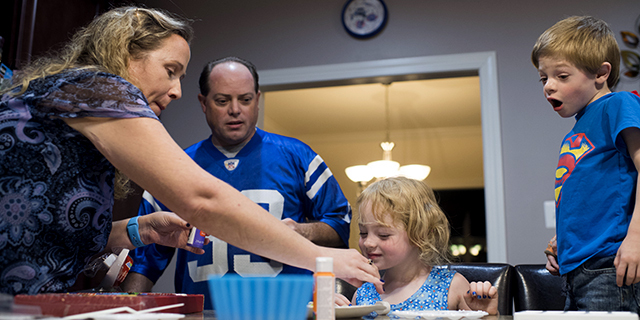 Changes in marriage and childbearing have reshaped the American family over the past half-century. Adults are marrying later in life, and a rising share are forgoing marriage altogether. The rise in unmarried people, in turn, has contributed to increasing shares of U.S. births outside of marriage and children living with an unmarried parent. While these trends are occurring nationwide, they are playing out somewhat differently across urban, suburban and rural counties, according to a new Pew Research Center analysis of U.S. Census Bureau data. Some of these variations are linked to demographic differences across the three community types – for instance, urban areas have higher shares of black residents, and rural areas have higher shares of older people. Overall, almost half (48%) of Americans ages 15 and older are married. The share is somewhat lower in urban areas (44%) than in suburban and rural areas (50% and 51%, respectively). Differences in race and ethnicity account for some of these disparities, since urban areas have a larger share of black residents, who are typically less likely to be married than other racial groups. Even so, the marriage gap across community types remains when looking only at whites: 49% of urban whites are married, compared with 53% of suburban whites and 54% of rural whites. And among blacks, those living in suburban areas are somewhat more likely to be married (32%) than those living in rural (27%) or urban (26%) areas. The fact that people in urban areas are younger, on average, than their suburban and rural counterparts could also contribute to their lower marriage rates, since younger people are less likely to be married. However, differences in marriage persist when controlling for age: 36% of urban adults ages 25 to 34 are married, compared with 44% of those in suburban areas and 46% of those in rural areas. When it comes to fertility, about a third (35%) of births to women ages 15 to 50 are to unmarried women, according to Census Bureau data. 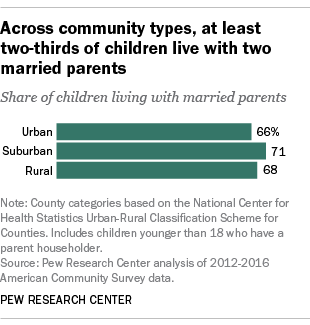 The shares again vary somewhat across community types: 39% of births to rural women occur outside of marriage, compared with 34% among suburban women. Among urban women, 36% of births occur outside of marriage. Community type differences are also evident among both black and white women. 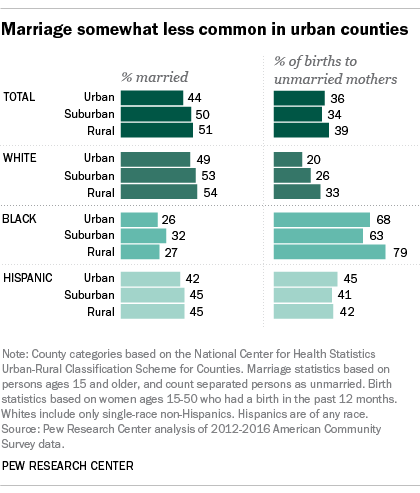 About eight-in-ten births to rural black women (79%) are to unmarried women, significantly higher than the share in urban (68%) or suburban (63%) areas. Among whites, 33% of births in rural areas are to unmarried women, compared with 20% in urban areas and 26% in the suburbs. Differences in the share of births outside of marriage vary only slightly by community type among Hispanic women. Adults in rural areas have lower levels of education, on average, than those living in other types of communities (19% have a bachelor’s degree or more, compared with at least 30% of those living in urban or suburban areas). This also contributes to the high rate of births to unmarried women in rural areas, as nonmarital births are linked to less education: Within each educational category, community type differences in births outside of marriage largely disappear. When it comes to children’s living arrangements, there are modest differences across community type, which are linked to the variation in both marriage and births outside of marriage. For example, in the suburbs, where marriage is relatively common and nonmarital births are relatively low, 71% of children live with two married parents. This is slightly higher than the 66% of children in urban areas living with two married parents, and similar to the 68% of rural children who live with two married parents.